After reading Seven Antibiotics to Stockpile and Why, readers have asked what dose of antibiotics to stockpile. As a general rule, I suggest that you not request multiple strengths of a single medicine, as few if any doctors would agree to this. Here are my recommendations for the most appropriate doses of common antibiotics to stockpile and why. 1. Amoxicillin – Many pharmacies offer the 250 and 500 mg capsules at the same unit price. Amoxicillin tablets are also available, but may cost somewhat more than the capsules, depending on the pharmacy. Amoxicillin tablets may be split more easily (than the powder in the capsules can be divided) to provide a lower dose if needed for children or small adults. (Babies are usually administered a reconstituted powder, but few pediatricians would prescribe this for stockpiling.) The best single option is amoxicillin 500 mg tablets (or capsules). 2. Cephalexin – Again, cephalexin 250 and 500 mg capsules are priced the same, so the 500 mg capsule is the better deal. The powder could be divided to obtain a lower dose, or the medicine could be taken twice daily rather than three or four times daily, as with amoxicillin, above, to yield a lower dose. 3. Ciprofloxacin – Because the 500 mg dose is used more commonly than the 250 mg dose, the higher dose is actually less expensive than the lower dose and may be split as needed. Except in dire emergencies, this drug is not used in children, so pediatric dosing does not apply. 4. Doxycycline – Available in either tablets or capsules at about the same cost, I suggest the 100 mg tablet, which may be split for lower dosing. 5. Erythrocin – Another case where the higher milligram dose may be cheaper than the lower dose, depending on the pharmacy. Check your local $4 list before asking your doctor for either the 250 or 500 mg tablet. In general, I would advise the higher dose. 6. Metronidazole – Another case of an adult medicine, though in this case, the higher dose is generally more expensive than the lower dose. Still, I’d recommend 500 mg tablets, which may be split if needed. 7. SMZ-TMP DS – The DS (double-strength) is used much more commonly than SMZ-TMP (single-strength), so again I recommend the higher dose, which also may be split for adult or pediatric use. 8. Tetracycline – The 250 mg and 500 mg capsules cost the same, so I’d go with the higher dose. Like doxycycline, tetracycline is not used in children whose teeth are still forming due to the potential for permanent staining. Most of the above recommendations are based on cost as well as traditional dosing. If your doctor is willing to write antibiotics for stockpiling at all, these are the ones most likely to be prescribed. About the Author: Cynthia J. Koelker, MD is the author of the book 101 Ways to Save Money on Health Care, which explains how to treat over 30 common medical conditions economically, and includes dozens of sections on treating yourself. $1000 of advice in a $10 book. 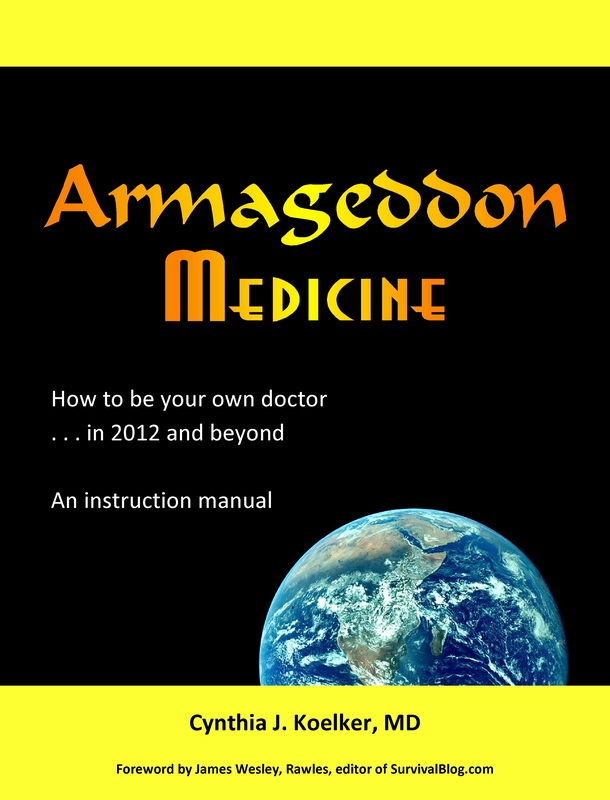 This entry was posted in Antibiotics, Medical archives, Perennial Favorites, Prescription Medications and tagged Amoxicillin, Antibacterial, Doctor of Medicine, Erythromycin, Health, Medicine, Pharmacy, Survivalism. Bookmark the permalink.